You can now buy t-shirts, hoodies and other merch featuring the Staycation Live logo and our new map from our new Spreadshirt shop. Get your dancing shoes on and get ready to shake what your momma gave you at this year’s Staycation Live! The Destroyers are a collection of rogues and misfits surfing a tidal wave of horns, fiddles and guitars! Rapidly exploding from the ‘Balkan Brass’ genre they emerge as an anarchic orchestra of blazing passion and breathtaking originality. So enter the big top and be immersed in the winding world of the hurdy-gurdy, the sonorous land of the tuba and the exotic realm of the duduk. Be ready to be engulfed by a wall of mesmerizing virtuosity and a whirlwind of frenzied dancing! We needed a new map that reflected Godalming’s variety and vibrance, as well as the number of pubs we have! 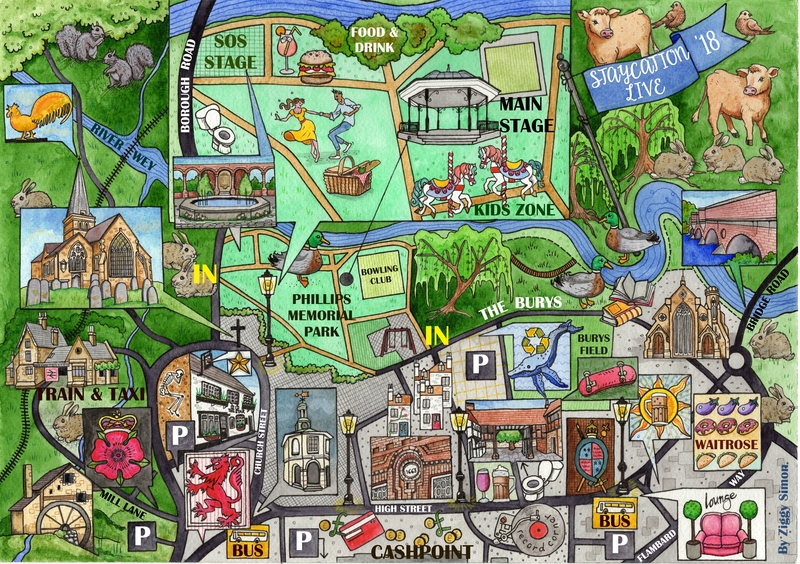 Thanks to Ziggy at Figment of my illustration for this masterpiece featuring the festival site and the surrounding town to help you all find your way around. If you’re interested in seeing more of Ziggy’s work, take a look at her Facebook page. We’re pleased to annouce that we’ll have our friends Beta Foods at this year’s festival with their range of vegan burgers and “meatball” subs. Their food is healthy and completely animal free so you can enjoy that burger guilt free! If you’d like to find out more about Beta Foods, just visit their website at https://www.betafoods.net/.